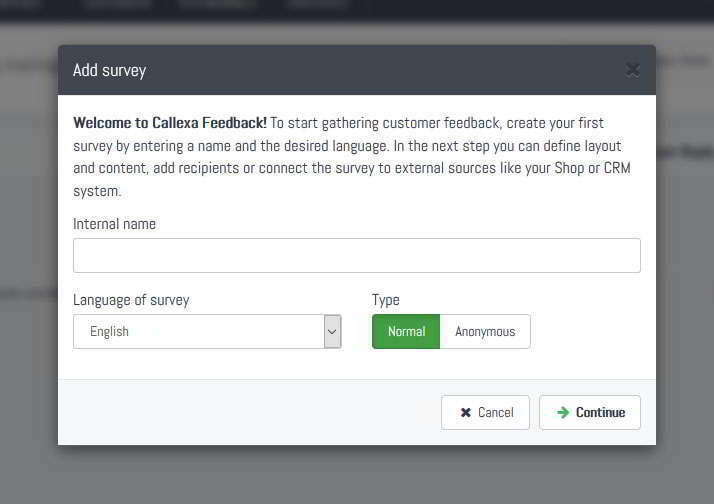 When you first log into your fresh Callexa account you are prompted to create your first survey. Just define an internal name (not visible to your customers), set the language and submit. On the next page customize your survey's layout, text blocks and follow-up questions. You can change all those settings at any time in the future. Read the "Creation and Customization of a Survey" guide for more information. 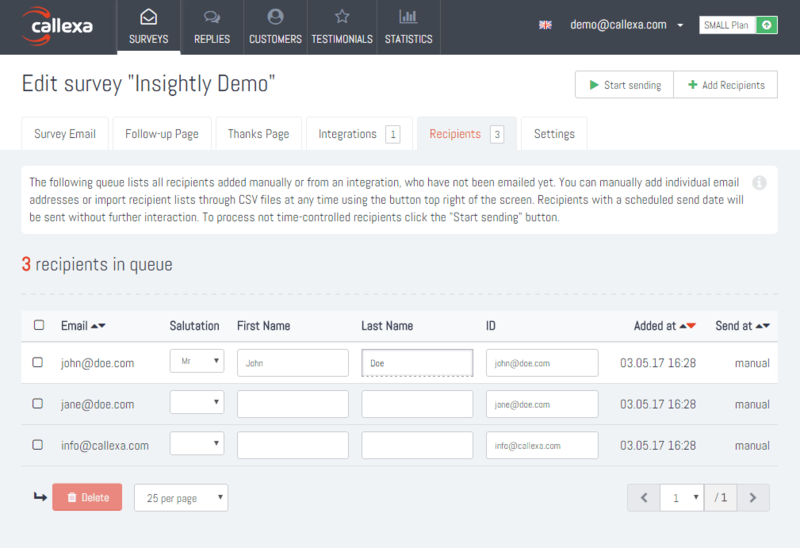 Now click the "Integrations" tab of your survey, look for the Mailchimp card and click "Activate". You will be redirected to Mailchimp in order to grant Callexa authorization to your Mailchimp account. Note: Callexa will only read the IDs, subscription dates, as well as the email address and full name of the subscriber. We do not store or process any other content from your Mailchimp account. If the authorization was successful, you will be prompted to configure the settings for the automated import. You must select at least one mailing list (or segment) to import from. If you select a segment, make sure that you do not select the main list as well. Automated import: Suitable for frequently sent Newsletters. Let's say you have a weekly newsletter and your goal is to get feedback after the 4th newsletter has been sent to a subscriber. Put in a delay of around 35 days and select the corresponding mailing list. Hit "Save and activate automation" and you are done. Control yourself when you want to send surveys. Select a mailing list but then hit "Cancel" to leave the automation disabled. The Mailchimp integration card will stay yellow, meaning that the automation is paused. Manual import: Click the "One-Time Import" and a dialog will pop up asking for the subscription timespan and mailing list to import from. 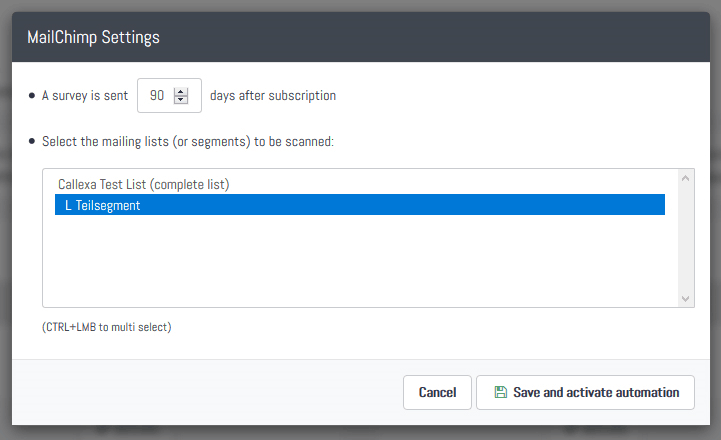 You can leave the timespan empty to import all subscribers from the selected list or segment. Repeat this import whenever you want but keep in mind that there is a minimum interval for how often you can survey the same subscriber. This interval can be configured through the "Settings" tab of your survey. Clicking "Start Import" redirects you to the recipients queue of your survey, which will be filled with the imported subscribers. This process can take a few minutes to finish. When it's done just click the "Start sending" button top right of the screen.